Go into any bookshop in Edinburgh, and take a look at the "Local Interest" section. It doesn't take long to realise that the marketplace for guidebooks about Edinburgh is a crowded one. Does the world really need another? 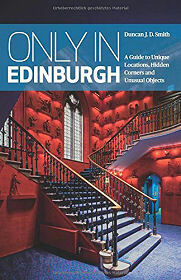 You might not think so, but we're fairly sure that "Only In Edinburgh: A Guide to Unique Locations, Hidden Corners & Unusual Objects" by Duncan J. D. Smith will quickly change your mind. "Only In Edinburgh" is the latest in a series of books that take a very fresh and intriguing look at many of the most visited cities in Europe. It is such a resounding success as a guidebook because it takes the reader far beyond the visitor attractions that appear in just about every guide to the city. Duncan J. D. Smith styles himself as the "Urban Explorer", and that seems entirely justified. He has managed to penetrate beneath the skin of the city which we believe to be the best in the world, and the result is a book that will be of lasting value to visitors as well as to residents who already think they know their city well. The book starts with a brief introduction that neatly encapsulates Edinburgh's long history and interesting geography, and this is followed by just over a hundred two (or in some cases three) page sections, each devoted to a particular place, or feature, or attraction. Each section is illustrated with a nice photo and comes with information about where its subject is and how to get there using public transport. The book does not overlook the city's obvious attractions such as Edinburgh Castle; the city's festivals; St Giles' Cathedral; Waverley Station; and the Scottish Parliament. But the author has taken a lot of trouble to add in more quirky elements, such as the Edinburgh of Inspector Rebus, of Sherlock Holmes, of "Trainspotting" and of the freemasons. Unusual shops, markets and places of worship also feature. We defy anyone, however well they think they know the city, to browse this book and not be amazed at the places they weren't aware of. We found enough to ensure our copy is going to remain in active use for some time to come. How, for example, could we not have known that there is a replica American Wild West street in Morningside? There is a second reason why "Only In Edinburgh" is such a "must buy". The quality of the production is outstanding. From the moment you peel back the shrink-wrap plastic you realise that this is a book produced by someone who wants to give his readers the most pleasurable experience possible. Books are tactile things, and this one feels stylish and modern and glossy, and the large fold-back cover extensions make ideal bookmarks as well as allowing easy access to the excellent index maps. Would we buy it ourselves? Well the next time we are planning a trip to London, or Paris, or Vienna, or any of the other cities covered by titles in the series, we will certainly ensure we buy a copy of the relevant "Only In..." guide before we go.